The leading cause of developing mesothelioma is exposure to asbestos. Asbestos is a name that denotes a variety of six naturally occurring fibrous minerals. Asbestos is mined from the earth and then milled and was historically used in many different products. For example, asbestos was used in insulation, brake linings, industrial sealants and construction materials. References to asbestos date far back in time to around 2.000 B.C. Asbestos is a Greek word meaning, “unquenchable” or “inextinguishable.” Asbestos was used in products because the material was strong, durable, resistant to fire and heat, and relatively inexpensive. The most common type of asbestos fiber used historically in the United States (over 90%) is the serpentine variety also known as chrysotile. Chrysotile asbestos was often used in many different products including brake linings, spackling compounds, floor tiles and roofing materials. Amosite asbestos, mined in South Africa, was used in certain types of insulation, often mixed with chrysotile asbestos. Crocidolite asbestos, also mined in South Africa as well as Australia, was rarely used in the United States, but was found in asbestos cement pipe and board as well as industrial sealants (gaskets and packing) used in chemical and corrosive applications. Tremolite and anthophyllite asbestos are known as non-commercial amphibolies because they were not commercially sold as asbestos fibers in and of themselves. These types of fibers instead are known contaminants of other minerals. Tremolite asbestos is a known contaminant of chrysotile asbestos. Both tremolite and anthophyllite asbestos are also known contaminants of certain talc and vermiculite deposites. The most well-known contaminated talc deposit is located in Upstate New York, whereas the most well-known contaminated vermiculate deposit is located in Libby, Montana. Industrial talc contaminated with asbestos was commonly used as an ingredient in paints and ceramics. Vermiculite ore contaminated with asbestos was included in various products including attic insulation and fertilizer. Some cosmetic talc products used sources of talc that were contaminated with asbestos. Asbestos exposure is the only well-established cause of malignant mesothelioma in the United States. At least 80% of all mesothelioma cases have some identifiable asbestos exposure. However, in other cases asbestos cannot be excluded as a cause of mesothelioma because of the difficulty in ascertaining past asbestos exposures. Some scientists believe that therapeutic radiation therapy may be a contributing risk factor for the development of mesothelioma, particularly in people also exposed to asbestos. However, it has not been established that radiation therapy can cause mesothelioma in the absence of asbestos exposure. Many occupations have been known to have asbestos exposure that can result in mesothelioma. For instance, mechanics, factory workers, ship builders, construction workers, electricians, plumbers, people who served in the military (for example the Navy) are all known to be at increased risk of developing mesothelioma. However, regardless of a person’s occupation, mesothelioma can occur if a person is exposed to asbestos. 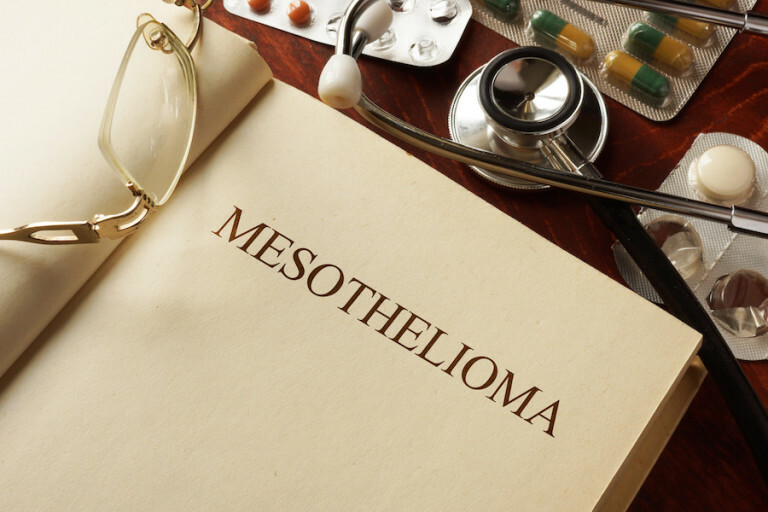 Mesothelioma is also known to be caused by take-home asbestos exposure. Family members often worked with asbestos products and, not knowing of the hazards, wore their work clothes home. Family members would have contact with asbestos on the worker’s clothing through physical contact (like hugging) or laundering the clothing. Asbestos was also used in products in the home and many people were exposed during home renovation projects. A once-popular household product known as joint compound was banned from containing asbestos by the U.S. government in 1977. There is no known safe level of asbestos exposure. Brief or low-levels of exposure are capable of causing mesothelioma. However, fortunately not every person who has been exposed to asbestos will get this disease. Every person has a different genetic susceptibility to getting mesothelioma from asbestos exposure –this is known as individual susceptibility. So there are cases where the person doing the work day in and day out does not develop the disease, whereas the wife at home getting exposed through the clothing does develop the disease.